Insoluble food fabric - Maize Cellulose; Soluble food fabric - Polyglucosan; Haw Berry powder and natural sweeteners. 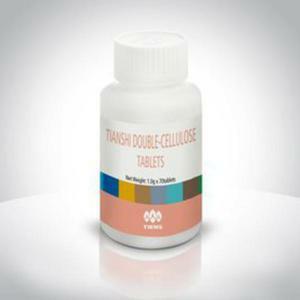 Tiens Double-Cellulose Tablets are a source of both soluble and insoluble fibers that will help restore normal bowel movements and regularity. Living in the 21st century, your diet has become more and more refined with a reduced intake of vegetal cellulose, which may lead to a series of digestive disorders. Tiens carried out extensive research to produce this natural food supplement that relieves and prevents constipation and other chronic diseases associated with the improper elimination of waste from the body. These chewable tablets are developed to stimulate intestinal movement and prevent constipation by supplying food fabric (one of the main human nutrients). When this product is taken in and comes into contact with water, it swells to make a soft bulky material that softens waste products, creating a large amount of soft matter. The volume of this matter produces pressure in the alimentary canal that helps the body ready itself to eliminate waste. It is effective in weight loss. Who is Tiens Double Cellulose suitable for? Those wanting to cleanse their intestines and neutralize certain toxic elements in the body. take 3-4 tablets 3 times daily by chewing.